John "Bud" Daley II served in the Korean War as a corpsman, where he learned the importance of quality patient care. After leaving Korea, he was assigned to the Philippine Islands, where he managed a military ambulance. Through his experience, Bud realized that medically trained personnel should be available to everyone in a time of need. Upon leaving the army in 1949, Bud travelled to Fargo, ND and worked for an ambulance company, where he learned what it took to run such a service. With little money and plenty of determination, Bud returned to his home in Harvey, IL and Daley’s Ambulance was born on September 1, 1950. In 1955, Bud married Betty, who became his partner in the business and in life. Betty would answer the phone and talk on the radio from the family’s kitchen table. The company started with two used ambulances (a 1936 LaSalle and a 1946 Packard), which were equipped with first aid equipment, including oxygen. When the American Red Cross developed a training program, all of Daley’s employees attended, becoming the first company to hold advanced first aid certificates. In 1965, the American College of Surgeons came up with guidelines for splinting and handling traumatic injuries; Daley’s participated in the training to further educate their staff. In 1972, the television show ‘Emergency’ forever changed the face of Emergency Medical Services by introducing the path EMS would follow. Daley’s was a leader in having a certified staff of Emergency Medical Technicians and Paramedics. Daley’s was the first private ambulance to provide Advanced Life Support Service in the Chicago area. The Daley family has called Dolton home since 1974 when they owned and operated their first building located at 132 East Sibley Blvd, with 2 ALS paramedic units, providing service to the Village of Dolton. As the need for quality and dependable service grew, Daley's quickly emerged as the largest Pre-Hospital Emergency Medical Service provider in the South Cook County Emergency Service area. Daley's Medical Transport outgrew the 132 East Sibley facility, and built a facility at 1234 East Sibley in May of 1995. 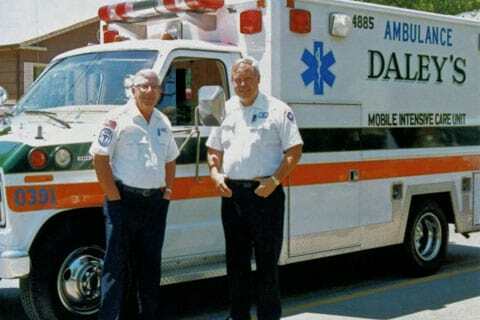 Following the passing of the founder John “Bud” Daley Jr. in 2001, a new company was born as Daley's Medical Transport d/b/a Bud's Ambulance. Today, John “Jack” Daley III is the President and CEO. Jack has been a paramedic for 38 years. Tom Wappel is an equal owner and serves as the Executive Vice President, also a paramedic for 32 years. Both owners are hands on with day to day operations. The executive management are all licensed paramedics, and are required to go out on an ambulance on a regular basis. In August 2012, Daley’s Ambulance opened operations in Joliet, IL and continues to grow every year. Bud’s / Daley’s have 180 dedicated employees, 25 ambulances, and 1 supervisor vehicle.